Team Little Big seems more interested in each other while Asuka is concerned about The Miz ending her streak in the first semifinal match of the Mixed Match Challenge. Charlotte and Bobby Roode battle Rusev and Lana in the last quarter-final match of the Mixed Match Challenge. 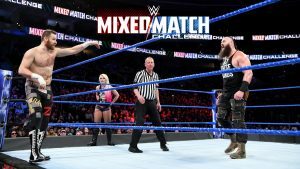 Sami Zayn does his best to avoid Braun Strowman while Becky Lynch and ALexa Bliss have a good match in the third week of the Mixed Match Challenge. 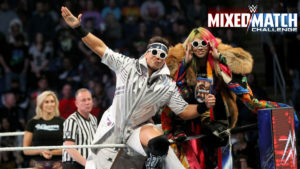 Big E and Carmella look to give Asuka her first “L” when she teams with The Miz in the second week of the WWE Mixed Match Challenge. The WWE Mixed match challenge begins with a good match between the Boss Club and Natalya and Nakamura.